Over the past decade, the price of electricity has been rising and is forecasted to continue that trend in the foreseeable future. Higher prices for electricity can make it difficult for schools to plan and budget for the future. 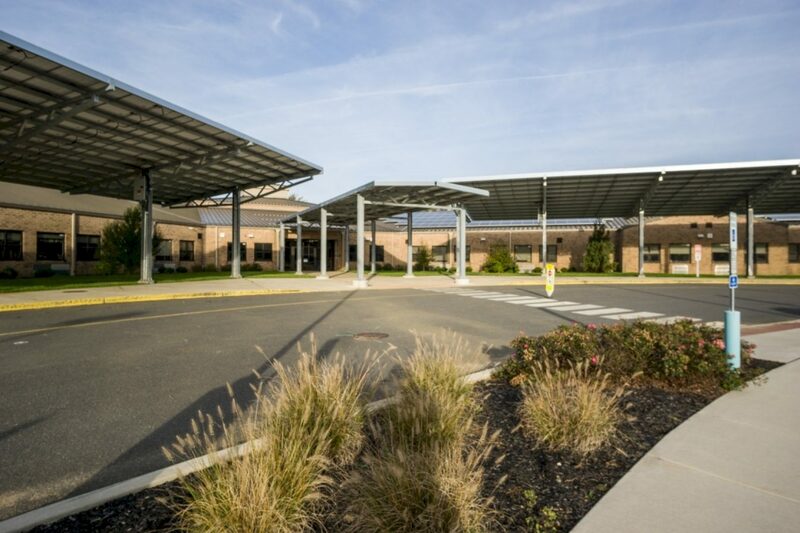 Faced with this issue, the East Greenwich Township School District in Gloucester County, New Jersey wanted to take control of their energy costs. 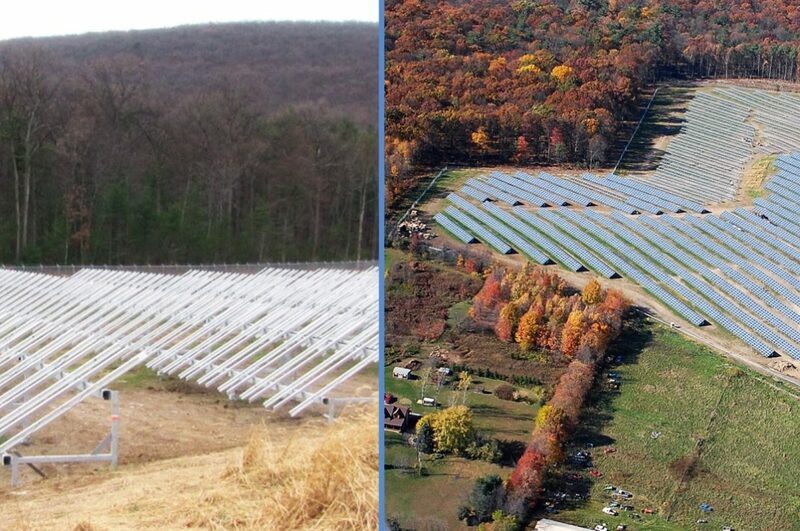 While attempting to solve the problem of increasingly-expensive energy, the District realized that, currently, solar power is the cheapest energy source in the world. 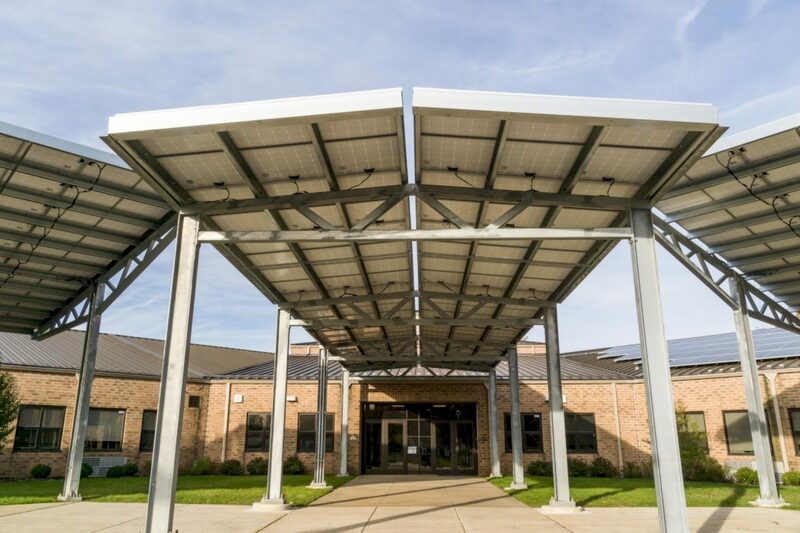 The timeless, durable protection and visual appeal of hot-dip galvanized carports will help make the Districts aggressive initiative become a reality. 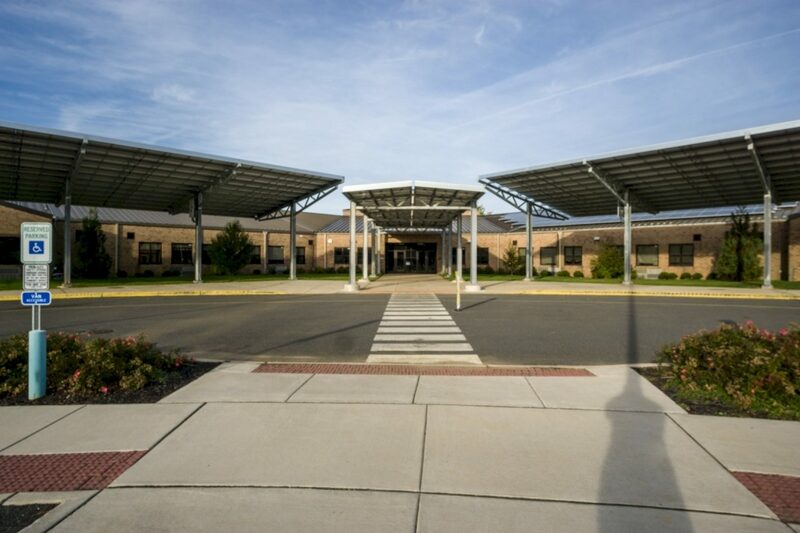 The East Greenwich Township School District has committed itself to financial excellence for many years and plans to continue its sound fiscal management to meet the challenges in the future. 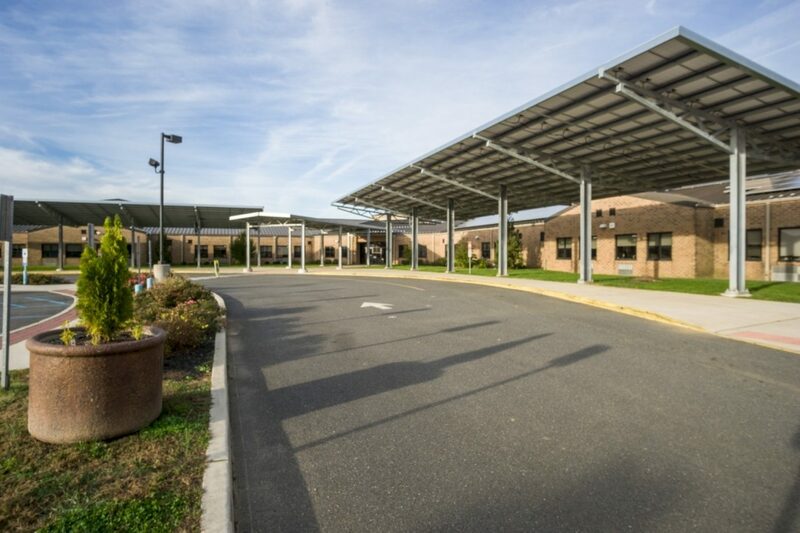 To continue towards their goal of fiscal responsibility, the District embarked on an aggressive initiative that would save Greenwich more than $100,000 per year through a Power Purchasing Agreement (PPA) with HESP Solar, which would involve no construction-related expenses to the school district. The solution was a hot-dip galvanized carport which would support solar panels to power the schools. 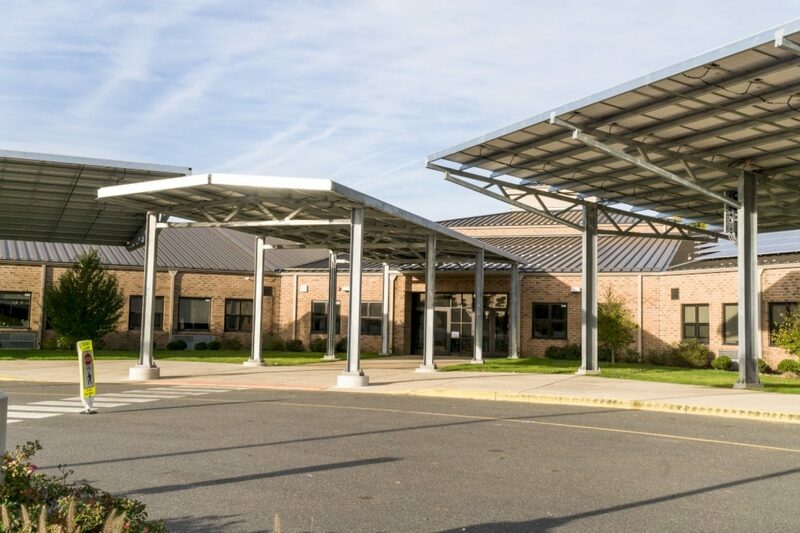 To protect their investment over the long term, the District selected hot-dip galvanized steel for its initial and long-term cost effectiveness and low maintenance. 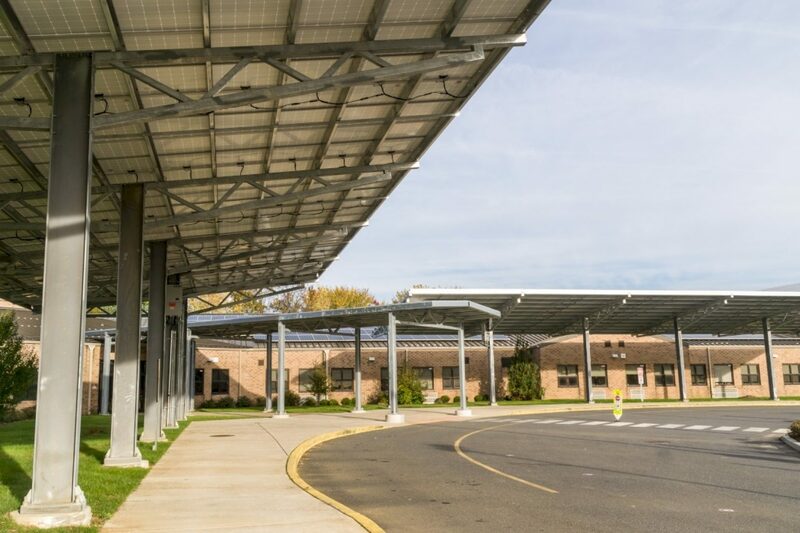 The East Greenwich Township School District pushed forward with their plan to produce their own electricity with a 1.7 Megawatt Solar Carport field located at the Mickle and Clark Schools. The solar array consists of 5,152 solar panels, all of which are supported by galvanized steel. 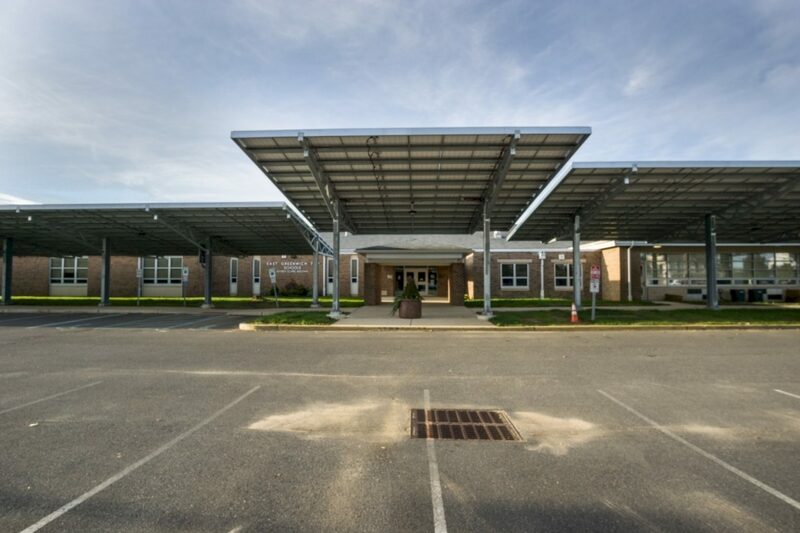 With available ground being scarce in New Jersey, the District was fortunate enough to have enough space to allow for the solar carports. However, the solar carports needed to work in conjunction with their current parking lot and sidewalk configurations so as not to waste any precious space. This created some design challenges that needed to be overcome. The project commenced on July 7th with a strict three-month completion date. The tight construction schedule required close interaction between the installer, fabricator, and galvanizer to meet the deadline seamlessly. The team members met numerous times to detail venting and drainage, and turnaround times. Thanks to the tremendous teamwork and communication, all deadlines were met, and the solar array is now generating electricity for the school. 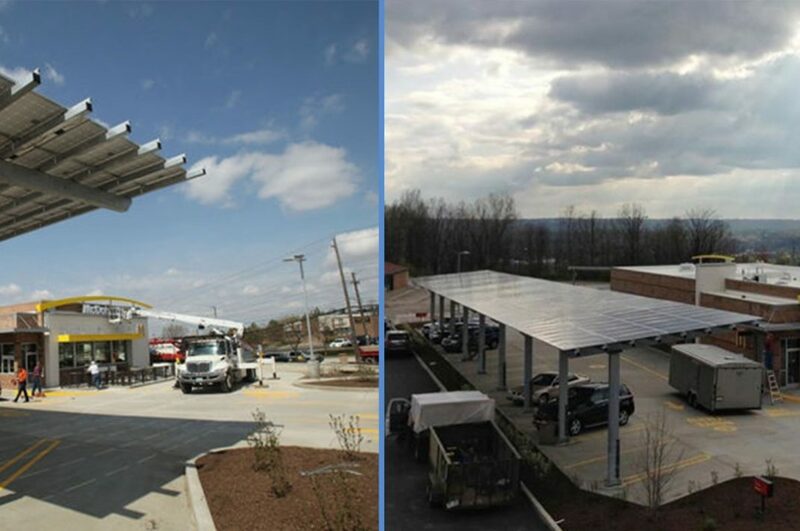 There are many benefits that come with the newly-implemented solar carports. For one, East Greenwich students can now learn from the solar power plant in their schools backyard. 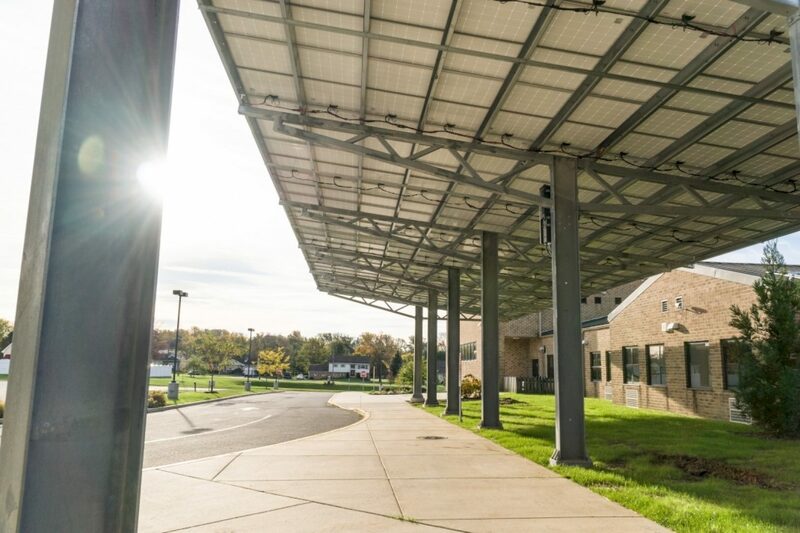 As students and Township employees alike walk past the solar display in the commencement of their daily activities, a natural curiosity will give way to a learning process that takes place both inside and outside of the classroom. 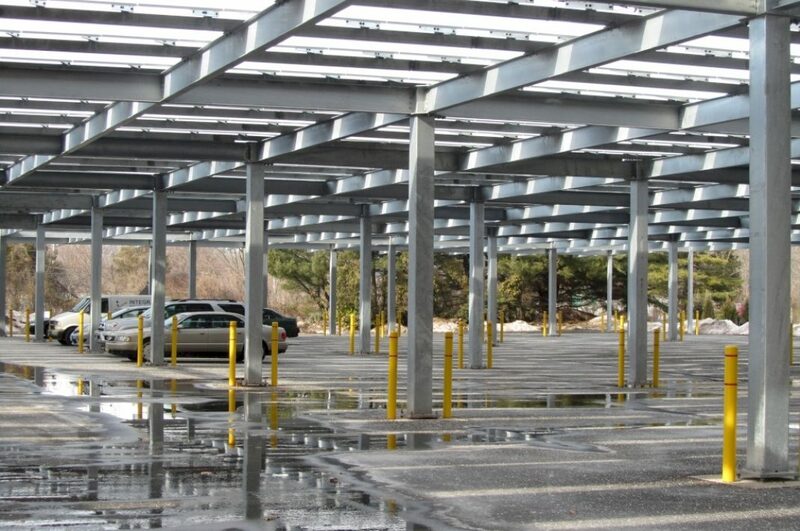 Students will not only learn about the sustainability of solar power, but also the sustainability of zinc.Not only would the carports support the new electrical system, but they also provide students and their cars protection from the elements. This presented some design challenges that needed to be overcome. 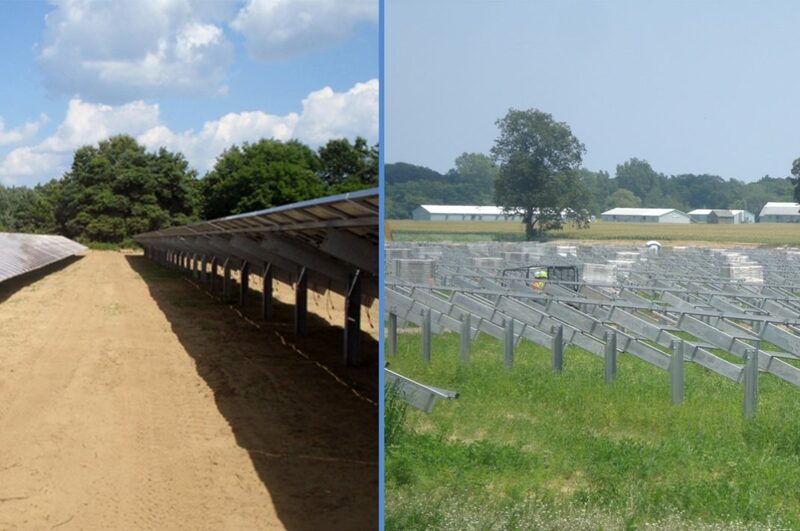 Patriot Solar based in Albion, Michigan was contracted to install the solar carports. 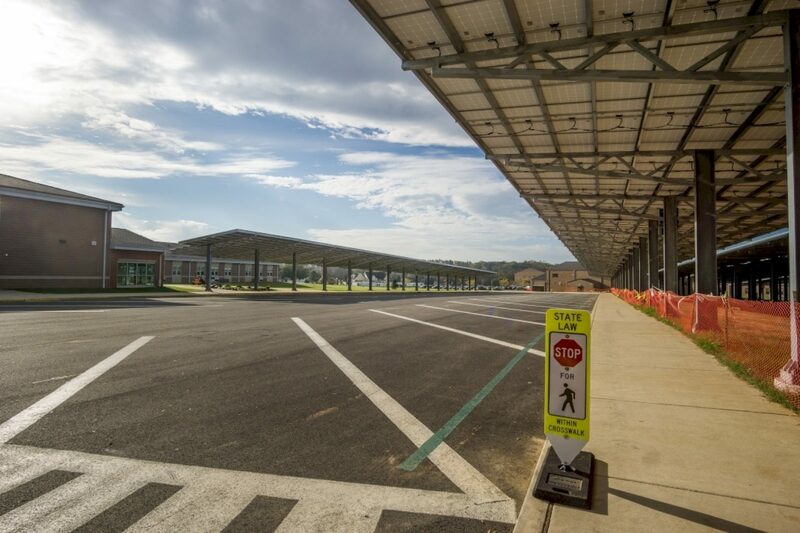 Furthermore, not only will the caports support the new solar array, but they also provide students and vehicles protection from the elements. 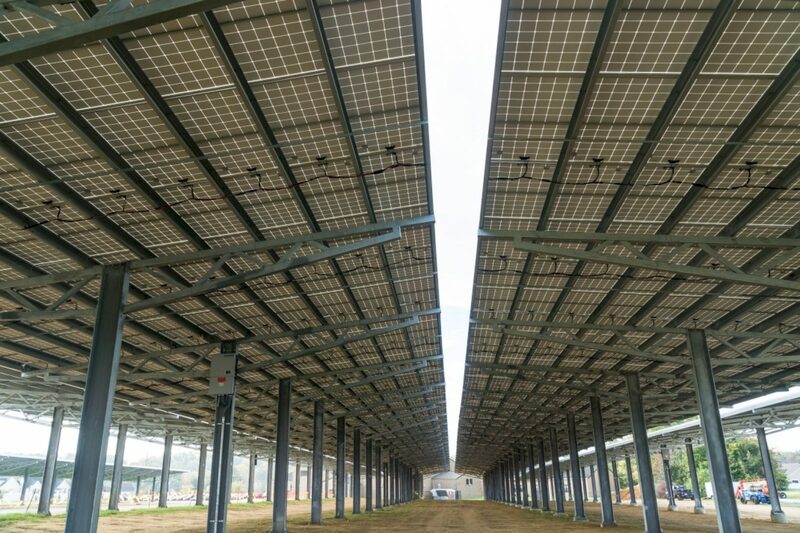 Similar to how the solar array will save the township money by providing energy independence, the hot-dip galvanized support structure will provide long-lasting infrastructure stability. All mounting posts, trusses and hardware.